Protaras Holiday Villa - Close Beach 8/10 - Facilities 9/10 - Sea Views 6/10 - RVC rating 9/10 - Overall 9/10. 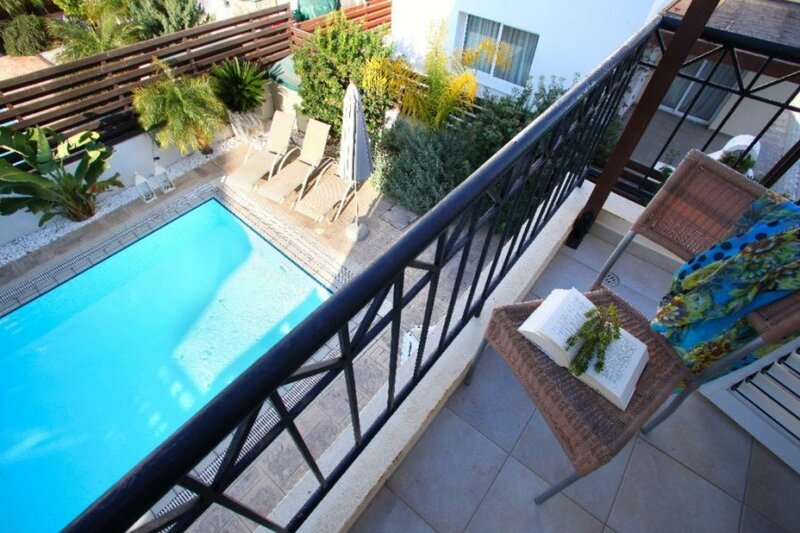 Spacious, 2-bedroom, 2-bathroom villa close to Grecian Park Hotel and Konnos Bay. Description Protaras Holiday Villa Kos 19 - Situated in a gated, quiet and secluded development Villa Kos 19 offers a large 4x8 metre overflow private pool, spacious patio area, gas BBQ and all the necessary amenities for a relaxing and comfortable holiday. The ground floor features a very spacious and modern furnished living room and dining area and an open plan fully equipped kitchen, as well as a guest WC with a shower enclosure. The living area opens up to the beautiful swimming pool surrounded by a fully grown garden that includes local aromatic plants and citrus and palm trees. On the first floor of the villa there is the family bathroom and two bedrooms, one with a double bed and one with two singles that can be joined to form a second double if required. The villa is fully air-conditioned and offers a private high speed Wi-Fi internet and satellite TV. Area description Protaras Holiday Villa Kos is ideally located in between the lively resort of Protaras and the beautifully popular scenic area of Capo Greko. The villa is walking distance to Grecian Park Hotel and to the Blue Flag beach of Konnos Bay. The villa is very close to the Cape Greco coastline, a pristine Mediterranean landscape, inviting during the spring to autumn seasons, and great for outdoor hikes and nature trips during the winter. This environmentally sensitive coastal area belongs to the Cape Greco National Park complex, a rugged landmass of dramatic features that has been sculpted by the cape's weather into an amazing number of bays, coves and projecting headlands, with a rich history dating back to neolithic times. The Park is laced with minute forms of nature, tiny survivors on rocky, dry grounds, tough small trees wedged in impossible positions and acres of pines above this coastline. The entry points to the sea are many, some do require an adventurous disposition. The beach at Konnos, a Blue-Flag destination, is complete with proper facilities and its charming beach cafe-bar which offers an oasis of shade under the pine trees and scenic views of the bay. Overlooking the action in the bay is "Cliffs", a great place for a drink and with a touch of intimacy and romance. Other venues overlooking the Bay are "Spartiatis"-a clean local tavern liked by locals and visitors alike. The area's sole hotel-the Grecian Park-is a modern and relaxed five-star neighbor who has respected and enhanced the natural surroundings. POLICIES 1. Listed Prices include 250KWh of electricity per week which is more than enough for normal use of the house. Additional electricity consumption is charged at Euro0.30/Kwh.